Remember the tool we used in class to find contact information for the woman with the Twitter account and web site? Well, along with trolling the ‘net to find hints of a suspected scammer’s political leanings, you could have used it to find the domain creation date that helped sniff out the recent BirthOrNot.com hoax as well. And speaking of scammers and backgrounding, check out some great work by my colleagues at the Times. At this point, everyone should have received a final grade on the research-inspired enterprise assignment. To give you an idea how you did relative to the rest of the class, the median grade was a B+. Good job, overall. In particular, every rewrite resulted in a better finished product. Thanks for your effort. Now don’t eat too much! Today’s bonus: Annais Morales has another byline in the New York Post, and it’s no turkey! Posted in Miscellaneous, Student bylines | Comments Off on Happy Thanksgiving! Earlier this week, I was telling one of my former students–who’s rapidly approaching graduation–that I’ve always targeted the specific places I wanted to work (rather than just trying to find where the openings are), so I figured I’d share one of my success stories. When I was in grad school, I knew I’d like to be a researcher in the NBC Information Center after having become familiar with it years earlier as an intern and freelancer in the sports department. Anyway, we had a school assignment where we had to survey a library, so I set it up to spend a few hours at NBC’s version and interview the manager there. When I finished the assignment, I sent her a copy of my report, which she seemed to like. Here’s the Wiki link for Barbara Gray’s handouts, now including yesterday’s presentation on social networking. Speaking of which, Charles Wilson supplemented Barbara’s lesson with some people finding thoughts of his own. Today’s bonus: Barbara also tipped me off to this article. Rush (among others) gets taken in again. On the News Service, check out Bianca Seidman-Shvarts’ coverage of the College Music Journalism (CMJ) music marathon here and here. And don’t miss multimedia profiles by Jennifer Hamblett on an art-world chronicler and Yudith Ho on a restorer of antique brass cash registers. Last but not least, Annais Morales got bylines in the New York Post here and here. Why am I not surprised to see the NYPD mentioned in the first article? I’m imagining her running toward synagogues in search of bombs. 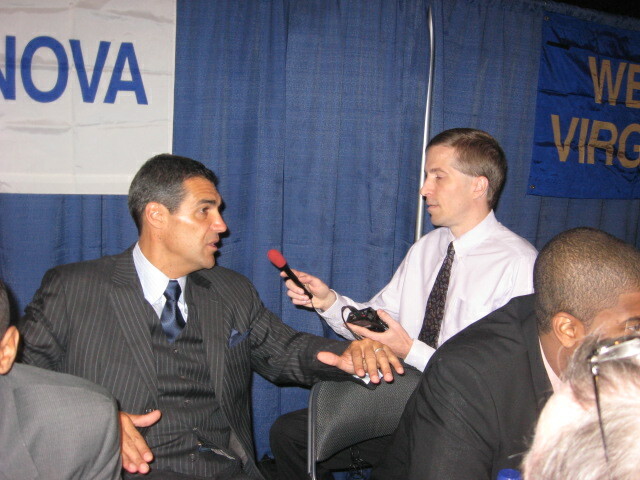 Interviewing Villanova basketball coach Jay Wright at Big East media day. While investigating the question Annais posed yesterday about translating job title codes on the New York City Civil List, I came to the conclusion that the easiest way to do it is just use SeeThroughNY’s City of New York payroll database. Using yesterday’s example of Thomas Farley, SeeThroughNY lists his position as Commissioner of Health rather than the job code number of 94357 on the Civil List, not to mention it gives his entire first name rather than just a first initial. I would still check the Civil List to confirm a salary since it is the primary source, but SeeThroughNY is definitely the more user-friendly tool. Also note that the Civil Lists go back farther than SeeThroughNY if you need to check salaries from past years. Never trust any person—no matter who it is—as your sole source of information, even about him or her self…and sometimes ESPECIALLY about him or her self (e.g. people lying about their age). Always verify!